Sequels have had a fraught history in cinema. The majority have been victims to the rule of diminishing returns, especially if the initial film was a perfect self-contained story in its own right. A precious few have broken out of this rut creating a richer world for the original piece. 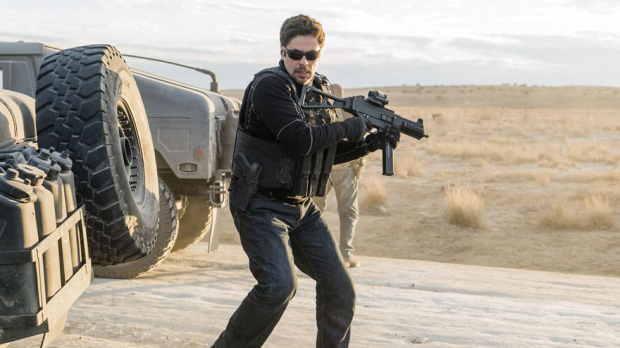 Is Sicario: Day of the Soldado the exception rather than the rule? When a terrorist bombing is aided by a Mexican people smuggling ring, the US government broadens its field of operations to include the drug cartels as terrorist organisations. It falls on Matt Graver (Josh Brolin) a specialist in various forms of the less sanctioned activities that American covert operations engage in, to start a war between the various Mexican cartels. With the help of the haunted Alejandro (Benicio Del Toro), they are tasked to stage the kidnapping of the daughter of a cartel boss (Isabela Moner), and light the fires of a blood feud between the gangs. An average and somewhat perfunctory film in its own right, Day of the Soldado might have been better as a stand alone piece rather than linking itself to the Sicario brand. By doing so it invites comparison to the original film, and although we can see aping of the visual style, it lacks the lyrical quality of Denis Villeneuve’s masterpiece. Its inferiority goes deeper than surface level, with the script lacking the complexity, or the ability to explore themes with the same nuance, ultimately coming off as hollow. Worse still, any brave decisions it does make in terms of storytelling, are rolled back within minutes demonstrating a lack of conviction. Although this sounds damning, Sicario: Day of the Soldado isn’t a bad film, rather it is just an ordinary one. Its action sequences remain tense and brutal, building the tension before plunging you into a maelstrom of gunfire and explosions. The political landscape it is set in remains significantly murky, one of false flag operations and off the books sanctioned wetwork. Benicio Del Toro’s Alejandro remains a riveting character, an open wound on the screen, carrying the emotional damage of the loss of his family and his quest for revenge. It’s just that a good sequel should expand and enrich the franchise, justifying its reason for being, and Sicario: Day of the Soldado doesn’t do that. On the positive side, it’s great to see Brolin and Del Toro return to the world of Sicario, giving a harsh no nonsense face to the American black ops proceedings. Brolin is perfect casting, and serves the role with a degree of flair. Isabela Moner is also engaging in the role of the young narco princess, although it is somewhat troubling that the main female role we have in this time seems infantilized and traumatised. An unnecessary sequel, Sicario: Day of the Soldado may set up the groundwork for a series of films to follow, but the question is “why?” Perhaps a planed third film will add some payoff to this piece, but as it stands it is certainly a step down in terms of quality.